What is the Experiments in motion project about? Experiments in Motion is a research initiative conducted by the Columbia University Graduate School of Architecture, Planning and Preservation in partnership with Audi of America to develop and test new paradigms in the relationship between motion, mobility and design. The program will draw from global thought leaders from around the university, architecture and design professionals, and an expanded network of urban mobility experts from New York City and Audi. 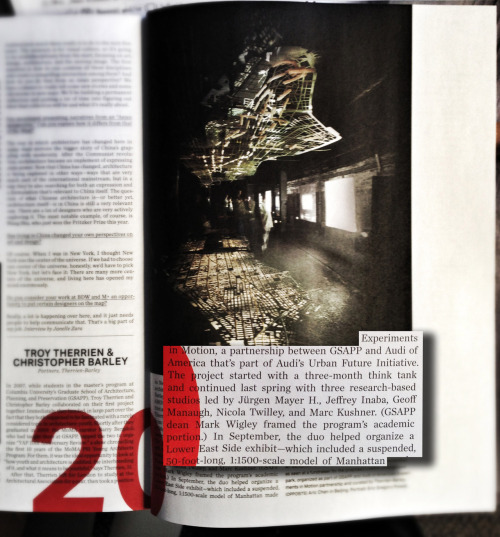 Part of the Audi Urban Future Initiative, the program is curated by Therrien Barley. What better way to celebrate over a year of Experiments in Motion than with a short film highlighting the design, research and innovation that went into partnership between Audi of America and Columbia University GSAPP . Swoon NYC worked with us to create a video that captures the collaboration between Audi of America and Columbia University GSAPP, spanning from the initial launch to last month’s culminating NYC installation and everything in between. The GIFs above are just a taste of the footage from the full video, which you can check out here. The exhibition is open and waiting for you to check it out! 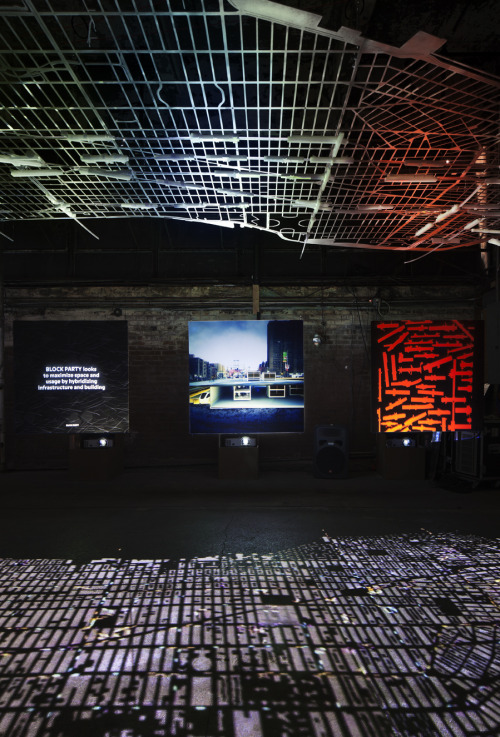 The installation marks the end of the first year of Experiments in Motion, a partnership between Audi of America and Columbia GSAPP through the Audi Urban Future Initiative. 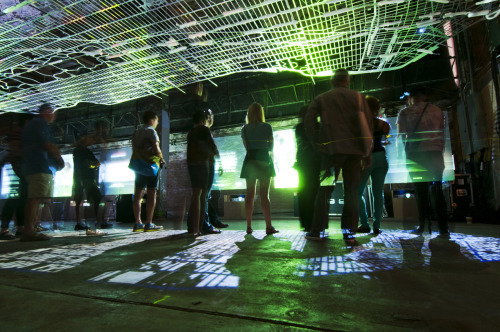 The exhibit, located at the Essex Street Warehouse in New York City, is free and open to the public through September 24. All photos taken by Collin Erickson. The Experiments in Motion exhibition is opening tomorrow! 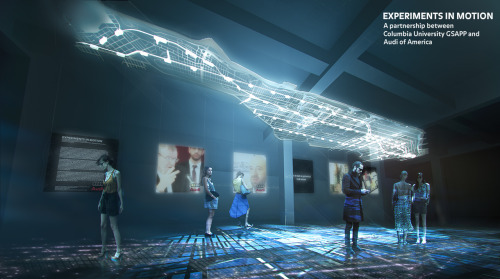 The exhibition is the culmination of a yearlong partnership between Audi of America and Columbia GSAPP. These photographs by Michael Moran provide a sneak peek at what is to come. The exhibition is open to the public at the Essex Street Warehouse in New York City September 15-24. More info here. An exhibition marking the end of the first year of Experiments in Motion, a partnership between Audi of America and Columbia GSAPP through the Audi Urban Future Initiative. Open to the public at the Essex Street Warehouse in New York City September 15-24. More info here. 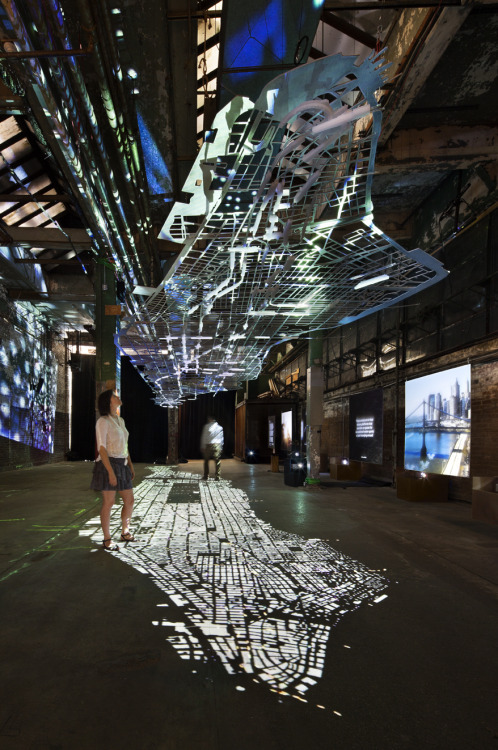 Experiments in Motion aims to imagine new forms of urban motion, new spaces for mobility and new visions for the future of New York City. Audi of America and Columbia University’s Graduate School of Architecture, Planning and Preservation (GSAPP), have come together for a research think tank and a series of architectural design studios with the goal of challenging both partners to rethink motion, think differently about mobility, and work together to imagine future cities. As part of the Audi Urban Future Initiative, Experiments in Motion is a research component in a world wide network that seeks to bring together experts from within Audi with architects, planners, and visionaries with the purpose of generating innovative solutions for mobility in cities. 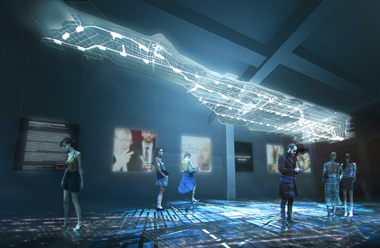 Partnering with the LowLine, Audi of America and Columbia are excited to connect their research on mobility to one of the most innovative proposals for a new kind of public space in New York City . As part of the partnership, students from the program have spent the summer researching all transportation systems in New York City, with special attention on exposing the potential of underground spaces. 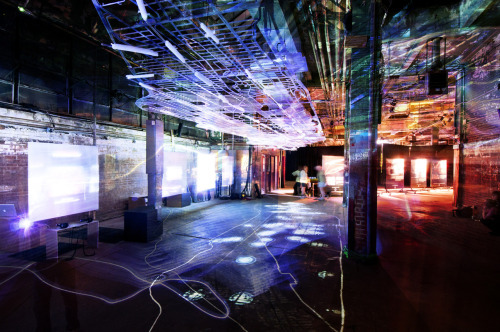 The research and designs generated by Experiments in Motion represent the future visions for how transportation spaces and infrastructures can be reimagined as sites for invention. The nine design proposals range from new architectural solutions for mobility today to provocative visions for the future. The fifty foot floating model of Manhattan was researched with the help of the MTA, the DOT, and the Center for Urban Real Estate (CURE). The suspended aluminum street grid is a 1:1500 scale replica of Manhattan’s road infrastructure while the plexiglass below presents a never before seen view of the architectural volumes of every subway station on the island. 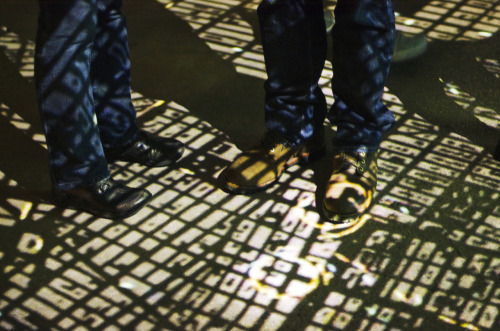 Projected onto the floor below is an animated shadow that reveals the flows of motion through the city. Subways, buses, bike lanes, ferries, tunnels and bridges are described as flows of motion which come together to expose the city as a interconnected system for mobility - a city of motion. 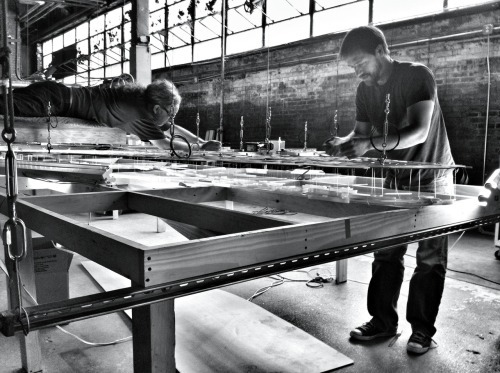 The Modular Table was used to facilitate the Experiments In Motion launch dinner. The launch dinner was a think tank event meant to accommodate seating 60 people on the exterior with 12 people seated in the interior. Designed through a collaboration between Fab Lab, C-Lab and Studio X of GSAPP Columbia University. A round table discussion on motion, while in motion, by leading professionals in the field who deal with motion. During the roundtable discussion, Mark Wigley, dean of Columbia University GSAPP asked the panel to respond to questions regarding the emergence of mobility within design. Panel participants included Abe Burmeister of Outlier Tailored Performance Clothing, Glen Cummings of MTWTF, Rob Giampietro of Project Projects, Michael Rock of 2x4, interaction designer Chris Woebken and Peter Vidani of Tumblr. The modular table was built for the Experiments in Motion launch dinner hosted by Audi of America and Columbia University GSAPP. It was designed through a collaboration by the Laboratory for Applied Building Sciences, C-Lab and Studio-X of GSAPP Columbia University. The launch dinner was a think tank event meant to accommodate seating for 60 people on the exterior with 12 people seated on moving seats in the interior. This modular table was designed specifically for the launch dinner with the ability to transform and reconfigure for future events. 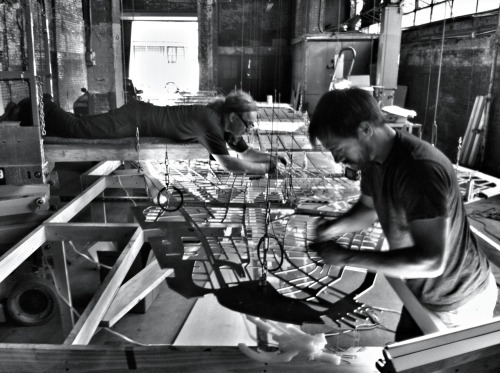 The modularity of the table led to interesting new configurations for facilitating discussion such as the round table on Architecture in Motion. In order to install the Experiments In Motion model, the construction team headed by Art Domantay built out this incredible moving rig allowing the model to be worked on at any desired height before it is raised up to its hanging positon and the table is removed. The installation is slated to be open to the public on Sept 15th at the Old Essex Market (corner of Broome and Essex). Our studio will invert the question of urban mobility, asking not how individuals can most efficiently navigate the static map of the built metropolis, but how the city's various systems and services, from policing to entertainment, can instead come to them. Through a series of case studies, site visits, and design challenges, we will explore the city of mobile services, from the familiar—ice cream trucks, food carts, bike messengers, and tow trucks—to the often radically unexpected, such as California's RV pot dispensaries or mobile lethal-injection facilities in China. The American city is resurgent after decades of wallowing in the shadow of its suburban neighbors. Increased density means forgotten corners of the city are ripe for architectural speculation. These spaces need more than a renovation - they need to be restitched into the city's network of transportation, communication and culture. "Under Over Out" is interested in the intersection of architecture and mobility where mobility is more than mere physical conveyance. By far New York has the highest ridership of public transportation among US cities. A significant percentage of people take the subway, bus, or commuter rail daily. Combined with the options of traveling by foot, bike, or taxi, New York stands as the country's premier model of urban multi-modal transit. Given the great number of people who travel by these means it would seem that the private automobile is not entirely needed. But be that as it may, the automobile is the main means of transportation.